Learning tones as an adult student of Mandarin is a fascinating journey. For most of us, it’s also very long. But there’s no alternative; learning tones is a must and more important than most students think. So, how long does it take to master the tones? This is a common questions in the introductory Chinese courses I’ve held. The answer is that it depends on many things, including how good you are at perceiving speech sounds and mimicking them, how much opportunity there is to practise (either designated by the teacher or, more likely, on your own initiative) and how much good pronunciation matters to you. If you have only one of these, the answer is probably that you will never master tones. With at least two of them covered, you will probably get there eventually. With all three, you should be fine, even if it will still take practice. To be able to overcome your problems, though, you need to know what they are! The reason I say that learning tones is a long and fascinating journey is that there are many different challenges to overcome on many levels. Mastering tones in isolated syllables is one thing, but being able to piece together complex sentences on the fly and pronounce them with good tones and intonation is another beast entirely. In this article, I’m going to list a number of different kinds of tone mistakes that students (including myself occasionally) make. This is very important, because the remedy is completely different depending on why you’re making the mistake. This is partly related to errors and mistakes in general, but there are several other things to consider when it comes to tones. Let’s have a look! …and what to do about them! The first problem is the most obvious one. Your teacher tell you that syllables have different tones and mean different things, but to you, mā má mǎ mà all sound the same. Or some combinations of them sound the same. Or you can hear that there is a difference, but you don’t know what it is and can’t use it to reliably tell the tones apart. That’s okay! Teaching your brain to hear the difference between the tones requires varied exposure over time, and won’t come overnight. My thesis research is actually about this very problem, so if you want to know more, you can check this article. You can also check my free tone training course. Even if you can hear the tones (both individual tones or combinations of them), you might not be able to reliably produce them accurately. To learn this, you need to do two things: mimic native speakers and get corrective feedback. First, just mimic the way a native speaker pronounces the tones (from your textbook or teacher if you’re a beginner). Record yourself, compare. Try again. Second, you have to get feedback from a native speaker, preferably a competent teacher. I can’t stress the importance of this enough. You will not succeed without this! Try playing tone bingo (works with non-teachers too). Finally, don’t get stuck on syllables! 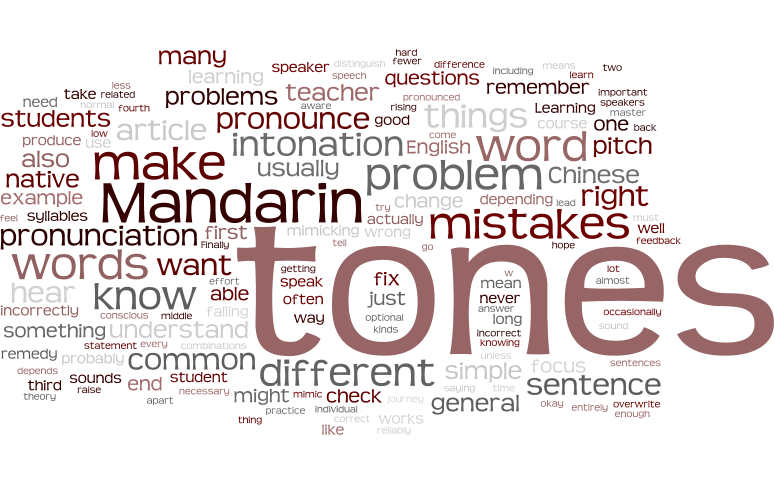 Most words in Mandarin have two syllables, so focus on tone pairs. This problem is common, but as a teacher, it’s hard to distinguish it from the second problem mentioned above. Even if you hear the tones and can pronounce them when asked to, you will still get it wrong if you don’t remember what tone(s) a certain word has, or if you remember it incorrectly. This problem is actually not related to pronunciation at all, even though the result is that you pronounce something incorrectly. The remedy is simple: Make sure you focus on memorising the tones too, not just the meaning of the word and how it’s written! 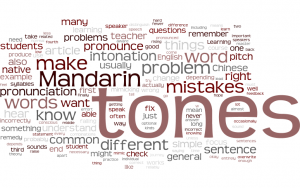 In short, learning tones in Mandarin is not optional! I’ve met students who complain that native speakers don’t understand what they’re saying unless it’s something really simple. I investigate further and find that many or most of their tones are off. However, it often turns out that they can pronounce the specific tone combination okay, they just don’t remember what the tones are on that word. I’ve even encountered a student who was baffled by my instruction to memorise the tones too and said something along the lines of: “What, do you mean I have to go back and relearn all the words I know?” Yes, exactly. Tones are not optional, even if they might just feel like unnecessary squiggles hovering over the letters. If you want a good system to remember the tones, check this article: Extending mnemonics: Tones and pronunciation. Naturally, you should still learn how the word is pronounced by saying it right often and hearing it even more. Mnemonics are crutches you use when that fails. Not remembering tones is not a problem only for beginner, of course; I forget tones too and I will continue to do so no matter how many years I study. The number of incorrect tones will decrease over time, though. Learning tones in isolation is never enough. Learning them in tone pairs is much better, but it’s still not enough. You might find that even if you know how to say 美国 (měiguó) correctly in isolation (it should be a low tone first, then a rising tone), but when it’s in the middle of a sentence, you make mistakes. Not with this particular word, but with tricky words in general. This problem is common and will probably never go away entirely. In general, your ability to pronounce things correctly depends on how well you have internalised the correct pronunciation. If very well, then you need no conscious effort at all and will still get it right every time, even in the middle of a sentence. If you know it, but not that well though, you will make mistakes since speaking Chinese requires conscious attention to other things apart from getting the tones right. In other words, doing everything at once is much harder than doing them separately. The remedy here is pretty simple: Practise speaking more. The more you speak, the more familiar you will become with the tones and less and less mental effort will be spent on getting them right. If you feel overwhelmed (which is normal), try focusing on one aspect at a time: Don’t try to improve everything at once, limit your focus. Phonology is the study of how sounds are organised in a language and how those sounds interact with each other. While it’s seldom necessary to understand the details, it’s definitely necessary to know the general rules for how tones influence each other in Mandarin. Fortunately, this is quite simple compared to some other Chinese dialects. Not knowing these things will lead to problems, both with individual words and with words in sentences. In general, the quicker you speak, the more the tones change. For example, while 我也很好 (wǒ yě hěn hǎo) can be pronounced as wó yě hén hǎo, it usually turns into wó yé hén hǎo in natural speech. These words cause a lot of trouble because many people use them without being aware of what they mean. Tone, or lexical tone as it’s also called, means that the pitch (tone height) of a syllable determines which word it is (hence lexical). 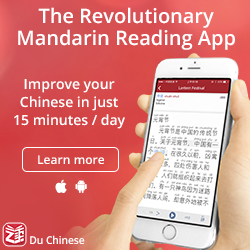 Mandarin has tones; English does not. Intonation, on the other hand, is not used to distinguish different words, but is instead used for a range of things, such as indicating questions, conveying the emotional state of the speaker and so on. Mandarin and English both have intonation. Now, this is in theory not difficult to understand, but it’s still extremely common that students allow the intonation patterns of their native language to overwrite the tones in Mandarin, which will lead to incorrect tones and bad communication. For example, in English, questions are usually signified by a rise of the pitch towards the end of the sentence: “Would you like some tea?” Compare this to: “I would like some tea.” In English, the final word in this sentence means the same, even if the pitch is rising in the first sentence and falling in the second. Not so in Mandarin. If you change the tone this way, you will change the word. This is very common when beginners ask questions. They want to say a word they’ve learnt, but want to check if they got the pronunciation right, so they raise the pitch, thereby making the tone incorrect (unless it happens to be a second tone, of course). The opposite is also common, i.e. falling on a a second tone at the end of a sentence because it’s a statement. 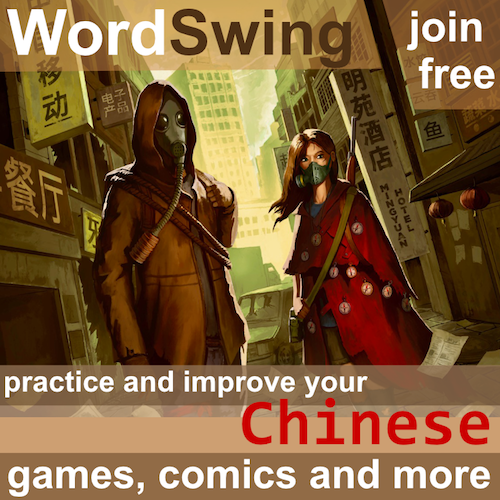 For example, if you say 我想喝一点茶 (wǒ xiǎng hē yì diǎn chá) but pronounce 茶 as chà, you’ll be wrong. Intonation does of course exist in Mandarin too, but it doesn’t overwrite the tones. Instead, the whole pitch range shifts, so to turn a statement with a fourth tone at the end into a question, you don’t raise it to a second tone, but instead make your fourth tone start and end higher than normal (but still a falling tone). I’m planning an article about intonation, so this will have to do for now! My advice for this problem is to not focus too much on intonation before you get the tones right. The risk of messing up the tones is high and it’s hard to avoid. If you do want to practice intonation, mimicking naturally produced Mandarin is by far the best method. Finally, even if you can avoid all the problems mentioned above, you will still make mistakes, especially if you have learnt something incorrectly from the start. For example, if you failed to notice that the third tone is usually a low tone, then read my article about it and understand how it works, you will still get it wrong occasionally. I fixed most of my third tones almost eight years ago and I still make mistakes sometimes. The only way to fix these problems is to stay vigilant. If you can hear your own mistakes, you should be fine. I can often hear when I make a mistake and fix it automatically. If you care about pronunciation a lot (which is a must if you want to fix this), make sure the people you enlist to help you know this so that they can remind you. Gradually, you will make fewer and fewer mistakes. If you thought that pronouncing tones in Mandarin was simple, even in theory, I hope this article has changed your mind. I also hope that you understand the importance of knowing what kind of problem you have, because the steps you take to fix the problem can be very different! Another related issue is timing of individual syllables / words. Whereas English (by my estimate) has about 5 different syllable durations, Mandarin syllables/words are all of the same duration, unless you are stressing something. Especially, the end of the sentence, where English speakers (and I assume others) tend to lengthen the last phrase/syllable of the sentence. That’s one of the main “uses” of “le”, “la”, “ah”, etc. BTW, some of this came from my Chinese teacher early on. Would love to see full article on this. It’s also why some Chinese sound very robot-like when they are speaking in English. This is a question more than a comment. Obviously tones are very important, but I sometimes have concluded that it isn’t just about getting the right tones. Is it not about getting the pronunciation right? 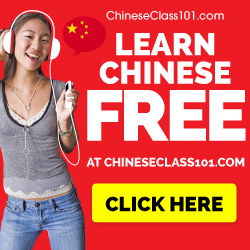 As adult learners of Chinese whose first language is not tonal we often get the message that we should learn the pronunciation and then incorporate the tone. Is it not that the tone is an integral part of the pronunciation? For example we often talk about how the tones vary in different dialects, such as between Sichuanese and standard Mandarin, but should we not say the pronunciation varies? Chinese children at primary schools (I presume) do not have classes on practising the third tone or whatever, they have their pronunciation corrected by parents, teachers and in the playground. Or am I totally wrong? You’re perfectly right! The reason I (often) talk about the separately is because tone problems are extremely common. I can count the number of students I’ve met with no serious tone problems on one hand, while I’ve met dozens who have almost no problems with pronunciation except the tones. So it makes sense to talk about tones separately. They are also often separated in Chinese, so it’s not uncommon for someone to say that your fāyīn is good, but that your shēngdiào have problems. I’m also curious, what in the article sparked your question? It seems fairly obvious to me that tone is one part of pronunciation, but that doesn’t mean that it’s not useful to talk about it separately, just like you can take any part of any other skill and discuss it in more detail? Thanks for the quick reply, Olle. To be honest, it wasn’t really the article that prompted my question. It was more that I have been thinking about it for a while and your article was a suitable one to respond to. I suppose it was partly driven by a frustration about how difficult pronunciation and tones can be. Obviously I do agree that tones can be taught and learned in isolation, but I have a similar problem to …. above. It is fairly easy to hear and reproduce tones in isolation, although achieving that can take anything from a couple of days to many months for different people. The problem is when speaking and listening. Context helps a lot, but when speaking does the memory of the tone and pronunciation not need to be combined or else any fluency and speed will be lost. 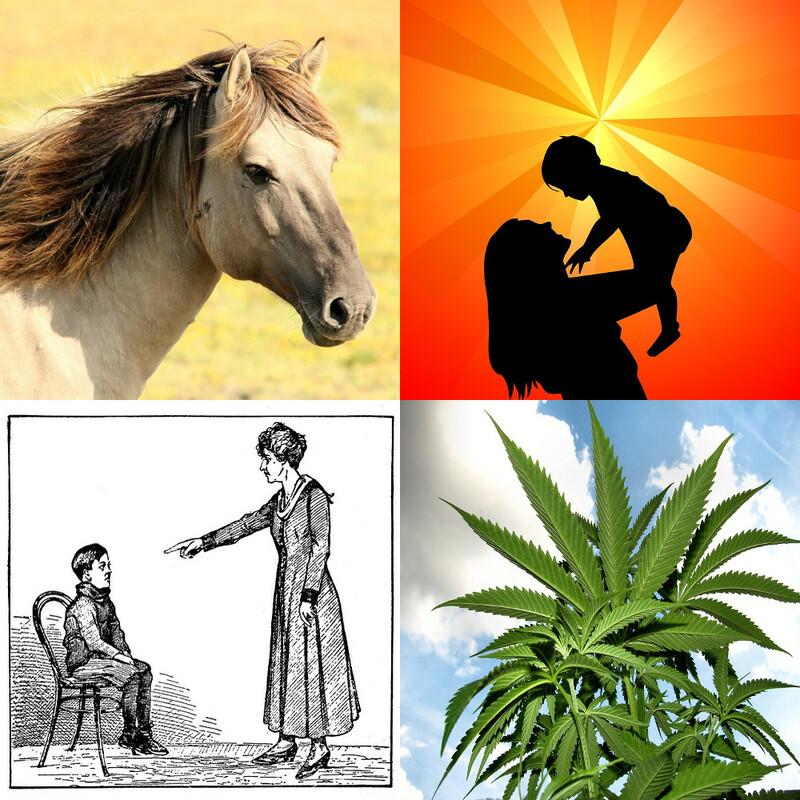 Some of the teaching of tones seemed strange to me. For example in tingli classes there would be exercises where we would listen to a recording of a sentence and then answer questions about what tones had been used. For the majority in the class this was mainly an exercise in guesswork and memory of the tone if we knew the word. I admit that I should really not be commenting. I have no linguistic training and despite a couple of years of full time study of Chinese at Chuanda I have not progressed much beyond a survival level of Chinese. 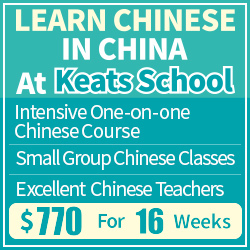 A big issue is that although I had exposure to Chinese for about 25 years it was really only at 55 that I had any formal language learning. Much too old I know. Well, most of the pronunciation training I’ve seen is completely useless (I even listed a few common examples here), so I’m not at all surprised that you have encountered that. Also, I didn’t say you should practise tones in isolation, I said that it’s useful to discuss separately the problem of learning tones. I do think it’s sometimes helpful to remove context because they are after all two different things. As you said, remembering the tones of a word is not the same thing as hearing the tones of that word. Minimal pair bingo is such an exercise I use quite a lot. Thanks, Olle. I think we agree. I’m definitely going to look at tone pair bingo.